The Historic District has a mix of historic and new homes. Several newer communities have been built over the last two decades, as well as the infill lot home here and there. There are many homes that have been restored over the years by investors and builders, as well as entire condominium units, both new and restored. 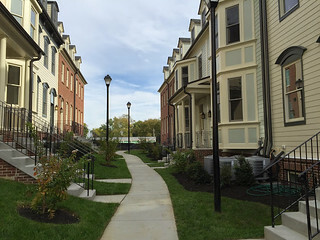 The Towns at Maxwell Square – A brand new community of townhouse condominiums, located on East 5th Street and Maxwell Avenue. There are 42 luxury townhouses with three and four floors. Some are garage units. They share common ground and have condominium fees. Maxwell Place Condominiums are located on Carroll Creek, next to the Carroll Creek Promenade. The 68 units were built by K. Hovnanian, with the unique feature of 196 parking spaces in the center, surrounded by the luxury condominiums. The condos are managed by Clagett Management, 7540 North Market Street. Creekside Plaza Condominiums are located on the 5th and 6th floors of the Creekside building, along Citizen’s Way and Carroll Creek. The mixed use building has offices, a restaurant, and a bank. Elevator access and the city parking deck come with the condominiums. North Pointe is a community of single-family homes, townhomes and duplexes. Downtown living AND new home construction are rare, as there are few lots left. Lancaster Craftmen Builders built these homes with energy efficient features. There are currently 22 home sites left. Historic Homes vary in downtown Frederick, from Federal townhouses, duplexes and single-family homes, to Victorian towns and single-family homes. From 7th Street on the North, to Clark Place on the South, from East Street to Bentz Street, homeowners enjoy downtown living in a walkable friendly city. What’s My Frederick Home Worth? Get a complimentary online valuation.